Cladding materials should be chosen to minimize environmental impacts and maximize a building’s energy performance. Twenty colors of glazed terra cotta adorn the façade of Hamburg, Germany’s Behörde für Stadtentwicklung und Umwelt/BSU (Office for Urban Development and Environment). 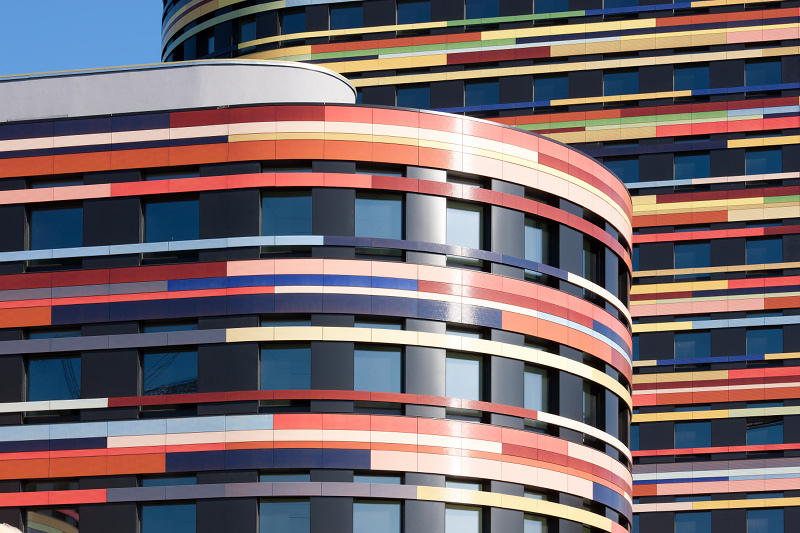 Cladding has to protect a building from moisture and wind and is an integral part of a wall assembly, responsible in surprising ways for a building’s overall thermal performance. There is a wide array of cladding materials available—and lots of ways to attach them—but a few key considerations can help us assess the environmental footprint of our cladding choices and how they affect the overall performance of the building. The three major categories of commercial wall assemblies—mass walls, barrier walls, and cavity walls—all handle moisture differently. As the name implies, mass walls like brick masonry, concrete, and rammed earth rely on the mass of the wall materials to stop moisture infiltration. The wall material doubles as cladding, and although there are exceptions to the rule, such as gaps within double-wythe brick walls, there are generally no secondary systems to prevent moisture from getting into the building if those materials fail. The same is true for barrier walls, where the cladding material and joint seals are the sole moisture barriers. Precast concrete panels and exterior insulation and finish systems (EIFS) are barrier walls, and older EIFS installations illustrate the challenges with these systems: cracks in the outer layer or poor installation often resulted in moisture infiltration, garnering them a poor reputation (new EIFS systems often include drainage; more on this later). Cavity walls are the most popular assemblies and differ from mass and barrier walls in that they contain an air space behind the cladding. Moisture that gets past the cladding is stopped by a weather barrier and drained away from the building, and because the air pressure is equalized in many of these systems (see How Rainscreens Work), moisture is not driven into the assembly.